Ann Forster of Ann Decker Design brought this bedroom renovation job to me. 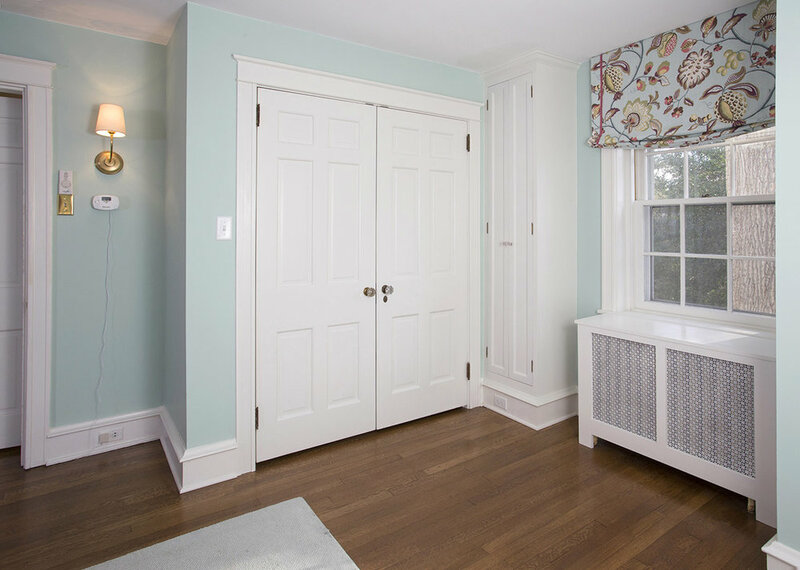 Her clients wanted to update their master bedroom with an enlarged closet and some built-ins. These are the two original closets. A new, larger closet will go in place of the left-hand closet, and the right-hand closet will have the door swing reversed for easier access. Finished shot of the new closet, tall shoe cabinet, and radiator cover. 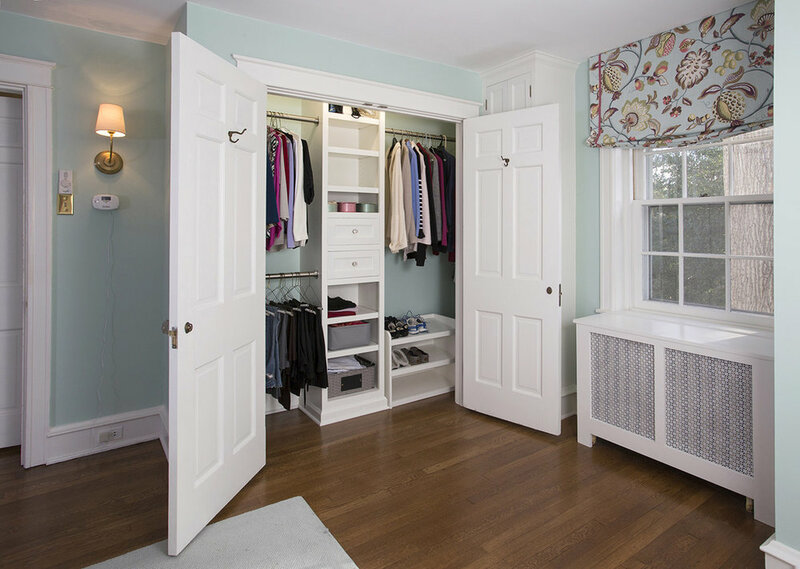 The double doors on the closet were originally single doors in the home and were repurposed for this closet. I also made custom door casing and baseboards to match the existing trim scheme. Shoe cabinet opened up shows lots of adjustable shelving for ample storage. The newly enlarged closet opens to reveal multiple hanger rods, a central built-in with inset drawers and adjustable shelving, and a custom shoe rack for additional storage. Before shot of the other side of the room. The plan called for two built-in bookshelves to connect over top of the bed, additional overhead lighting and wall sconces, and a window seat to the right. Finished shot of the right side of the bedroom. Each built-in features two inset drawers and a sawtooth adjustable shelf system. The radiator cover matches the other one on the far side of the room. The window seat opens for additional storage within. A cushion for the window seat was in the works at the time of this picture. The left side of the bedroom has a matching built-in bookshelf. The closet shown here is the original closet from the first picture with the door swing reversed. In this wide shot from the doorway, the two bookshelves frame the bed nicely. As usual, all the drawers I made for this project are solid maple with hand-cut dovetail joinery. All design and decorating work by Ann Forster of Ann Decker Design.